WrestleMania 35: Becky Lynch Vs. Charlotte Flair Vs. Ronda Rousey (Winner Takes All Title Match) - Wrestling Inc.
We cut to a helicopter flying above the stadium. SmackDown Women's Champion Charlotte Flair is in the helicopter. The copter lands outside of the stadium and Flair steps out. She has a crew put her robe on her and she walks to the stadium. We go to the ring and Hamilton introduces rocker Joan Jett. She starts performing her "Bad Reputation" song for the RAW Women's Champion. Jett plays for a minute or so until Ronda Rousey comes marching out from the back. Rousey heads straight to the ring and raises the title. Out next comes Charlotte. She walks straight to the ring as the fireworks go off. Becky Lynch is out next, no special entrance. Lynch marches right to the ring. We get formal ring introductions from Hamilton. The bell rings and they all face off, sizing each other up. Fans chant for Becky. Becky with an early submission attempt. Rousey with strikes to Becky into the corner. Becky and Rousey end up on the floor. 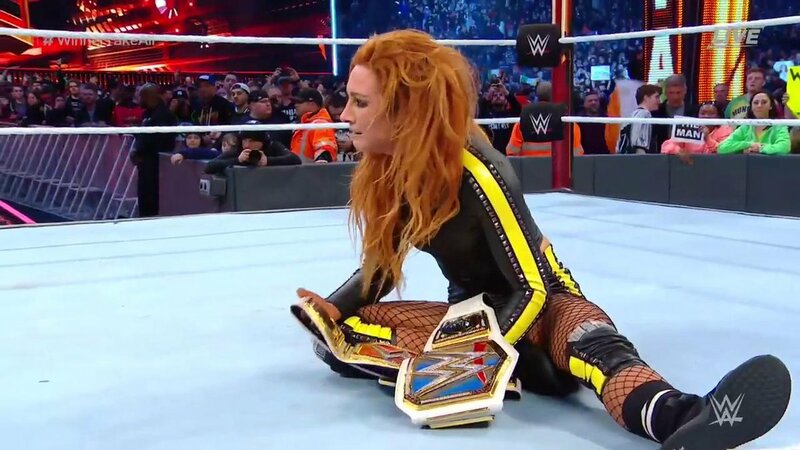 Rousey drops Becky against the barrier. Rousey grabs Flair on the floor now and drops her on the floor with a Piper's Pit. Rousey talks some trash and goes for Becky but Becky rams her into the steel ring post. Becky goes into the barrier. Flair comes over and launches Rousey into the barrier. Flair goes back into the ring and poses, playing to the crowd. Becky enters the ring and faces off with Flair. Fans chant for Becky. They go at it and trade big shots in the middle of the ring. Flair takes out Becky's bad knee and goes to work. Flair works on the arm now. Flair tries to use Becky's Dis-Arm Her but its blocked. Becky tries for a Figure Four attempt. They both rock each other and break. Rousey comes back in with a kick to Becky's face and a shot to Flair. Lynch and Flair double team Rousey now. Rousey with a submission on the ropes now. Becky makes the save, dropkicking Rousey to the floor. Rousey lands hard on her head on the floor. Lynch and Flair go at it in the ring again. Flair with a backbreaker and a face-first slam into the turnbuckles. Flair with more offense and another 2 count. Flair drops a knee to Becky's head. Fans try to rally for Becky as Flair slams her face-first. Flair goes to the corner for a moonsault but Becky gets the knees up and goes into Dis-Arm Her. Rousey runs in and breaks it, working Becky over for an armbar attempt. Flair with a running knee to Rousey's face. Flair stands over both opponents and nails a double Natural Selection for a 2 count on Becky, then a 2 count on Rousey. Flair unloads on Rousey with chops now. Flair ends up countering a submission with a Crab. Becky comes back in and drops Flair from behind to break it. Lynch with a double DDT on Lynch and Rousey at once. Lynch with a 2 count on Rousey and then a 2 count on Flair. Lynch shows some frustration already. Lynch with stiff kicks and trash talking to Flair. Flair fights back and they trade strikes in the middle of the ring. Flair gets sent to the apron but she boots Becky back. Flair goes to the top but Becky runs up and meets her. Becky nails a huge super Bexploder suplex from the top but Flair still kicks out at 2. Rousey works over both opponents at the same time now. Rousey applies a double armbar but Flair and Lynch work together to power up and slam Rousey with a powerbomb to break the double armbar. They power up again with another powerbomb. Rousey is still hanging on tonight. Flair and Lynch power up again for another powerbomb. Lynch and Flair trade shots now. Flair knocks Lynch out of the ring and covers Rousey for a close 2 count. Lynch works Flair over for another 2 count, then kicks her out of the ring. Lynch turns to Rousey while she's down. Lynch applies the Dis-Arm Her and keeps it locked until Rousey gets the rope. Rousey charges in the corner and Becky's knee barely hits her. Flair comes back in as Rousey gets dumped out. Flair climbs up with Becky on the top. Flair brings Becky to the mat with a hard landing. Flair gets a close 2 count and she's clutching her bad knee. Flair goes for Rousey but Becky goes for the Dis-Arm Her on Flair. Flair sends Lynch into the corner. Flair kicks Becky off the apron to the floor. Rousey comes from behind but Flair stops her and works over her bad knee. Flair slams the leg around the ring post. Flair applies the Figure Four around the ring post as Rousey screams in pain. Lynch helps break it. Flair ends up back in the ring with Rousey after Lynch goes into the barrier. Rousey counters a Flair submission for a 2 count. Flair gets the Figure Eight applied now. She bridges into the Figure Four but Becky comes flying in out of nowhere to break it up. They go on until Lynch brings a table from under the ring. Fans pop as she slides it in the ring. Lynch stands the table up in the ring. Flair decks her after she gets it up. Flair decks Lynch again and places her on top of the table. Flair goes to the top but Rousey cuts her off and Lynch. Rousey says she doesn't need a table, she tips it over as fans boo. Rousey unloads on Lynch with strikes now. Lynch tries for the Dis-Arm Her on Rousey but Flair runs in and hits a double Spear on both of them. She covers Lynch, then Rousey, for 2 counts. Flair is frustrated now. Flair props a table in the corner now. She slams Rousey's face into it several times. Becky comes for Flair again but Flair hits a Spear on her. Flair goes on and gets another close 2 count on Lynch. Flair gets up slowly. She charges at Lynch and Rousey but they both launch her into the table with a double hip toss. It doesn't break all the way. Flair is sent to the floor. Lynch and Rousey face off in the ring now as fans pop. They unload in the middle of the ring with strikes. Rousey with a huge kick to Lynch's face to drop her. Rousey hits a Piper's Pit on Lynch but Lynch immediately rolls her shoulders over for the pin to win both titles.